Ya gotta love it when a $100 cheque arrives in the mail . . . and you weren’t expecting it. In March 2006, I won the Canadian Writer’s Journal short fiction award for a short story called Squirrel at the Birdbell. However, the publisher of the magazine subsequently got sick, so everything ground to a halt for a few years. It wasn’t until the magazine got going again that the $100 award arrived in my mailbox. Squirrel at the Birdbell is based on real-life events and ended up in the final version of my book, A Widow’s Awakening. It illustrates the domino effect that the death of a loved one – or any significant loss – can have. A word of caution: there is some profanity. In our periwinkle blue bedroom, the bed, the vanity, the pictures on the wall; they all look the same and of course, are the same – but now I’m seeing them through fundamentally changed eyes. Sam will never sleep beside me again, or empty the change from his pockets onto the counter, or pray to the picture of Saint Jude tucked in the corner of our mirror before climbing into bed. I open the closet doors to get my pajamas and stumble backwards at the sight of Sam’s clothes. Grabbing his gray dress shirt, the one he’d worn to the wedding in Disneyland last week, I hold it up to my face. I breathe in his scent as if it can sustain me. Loss: I feel absolute loss. I pull out his flowered Hawaiian shirt and blue boxer shorts then gently shut the closet doors. I climb into his side of the bed and put my head on his pillow, clutching his ring tightly. I kiss his Timex, now on my wrist because it was given to me in the hospital. Then, like a wolf in her den or a Canada Goose in her nest, I begin mourning the loss of my mate. I throw in a prayer to God – if such a thing exists – to look after Sam (the non-physical part of him, if such a thing exists), wherever he is. With Jude, the patron saint of police officers, perhaps? I replay the events of the day in my mind. Sam fell; your husband is brain-dead; may we have his heart, liver and kidneys? Through a false ceiling; your husband is brain-dead; skin, kneecaps and eyeballs? No safety railing; your husband is brain-dead; the rest to medical research? I awake at 6:00am to see a reddish-orange light framing the edges of our bedroom window. I blink a couple of times to make sure I’m actually awake and then watch as the light slowly disappears. I recall the dream I just had: I’d been in an underground parkade and seen blood spatter on the concrete a few meters away. I was flying towards it with my body parallel to the ground, but when I got to the blood, my field of vision faded out around the edges – and I woke up. Although I don’t know the specifics about Sam’s actual fall, the dream gives me a strong sense of peace, as if I perhaps experienced the essence of his death. If so, I get the impression that when Sam’s head hit the cement, it was simply over for him…like the end of a film where the final scene fades to black. I fall back asleep for a few hours but when I awake the second time, around 8:00am, the entire truth and the horrific anguish that accompanies that comes crashing into me in this first moment of recall. There are no mysterious lights or strange dreams to buffer the reality; just excruciating emotional pain and sheer terror. There’s a knock on our bedroom door. “Can I come in?” It’s my sister-in-law. I manage to get out of bed and go downstairs to greet my fate – and the concerned faces of my two oldest brothers. “Good morning, Googie,” one brother greets me, using my childhood nickname. They stare at me, wide-eyed. “How about a coffee?” I suggest, not knowing what else to say. And so my first day as a thirty-two year old widow begins with poached eggs, toast and coffee…and a hole in my heart the size of Texas. After breakfast, I’m on my way upstairs to take a shower when I notice something hanging from our birch tree. At first I think it’s one of Sam’s black work socks, which wouldn’t make any sense, but when I get to the window I can see it’s a squirrel hanging upside down eating from the birdbell. I’ve never seen a squirrel there before. My life is quickly turning into one of those kid’s books where you have to find ten things wrong with a picture, like a person walking on air or a house with no door. 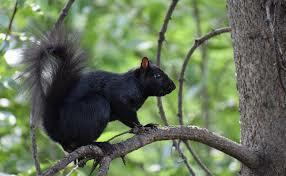 Yet seeing this squirrel makes me smile. I think of how Sam had got a kick out of Sasha’s behavior towards squirrels: she’d bark ferociously, tail wagging. I make a connection between that squirrel and Sam…I can’t rationalize it, but it gives me comfort. I’d planned to have Sasha blessed today at the annual ‘blessing of the animals’ ceremony – in honour of St Francis of Assisi, the patron saint of animals – at the Anglican church downtown, where Sam and I were married. My, how plans change. “I THINK I’M GONNA NEED SOME HELP IN HERE,” I scream out the bathroom door, still naked, hoping it’ll be my sister-in-law coming to my rescue and not one of my brothers. I throw on my robe but my hands are shaking so badly, I can’t tie it. I show her my package of birth control pills. “He’ll never touch me again.” I don’t recognize my own voice. She looks to the floor. “We’re never going to be parents,” I announce. She sits down on the bed beside me and holds me as I cry. And cry and cry. The death of a loved one can have a devastating domino effect. Thankfully, however, the dominoes don’t necessarily all fall down right away, one after the other – as the far-reaching effects of the loss become evident. Case in point was me not immediately realizing that the death of my husband also meant the end of the possibility of us having a child together. In hindsight, this was a gift…perhaps my mind was protecting me? Because if I had realized, on the day of John’s death, precisely ALL that losing him would entail, I wouldn’t have survived the day either. We can only handle so much. I suspect it is a very good thing we don’t know what the domino effect of a significant loss will be. Rather, we have to discover – day by day – all the big and small subsidiary losses…and learn to deal with those the very best we can. And when we can’t, we ask for help. On the flip side, there can also be many positive things that come from a significant loss. 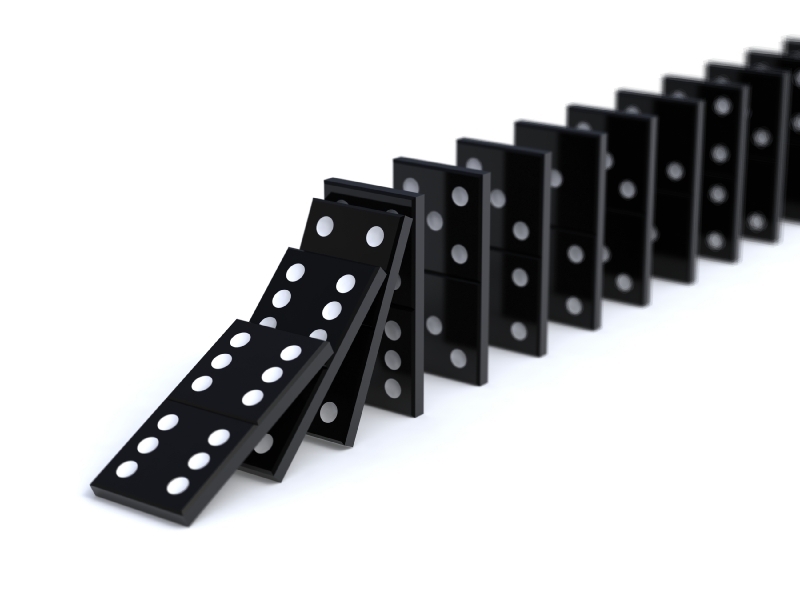 The domino effect need not be entirely negative. But in my experience, the sooner we face the true fallout out of a loss, the sooner we can get around to picking up some of those fallen dominoes again…and slowly starting a new game: the next chapter of our life. 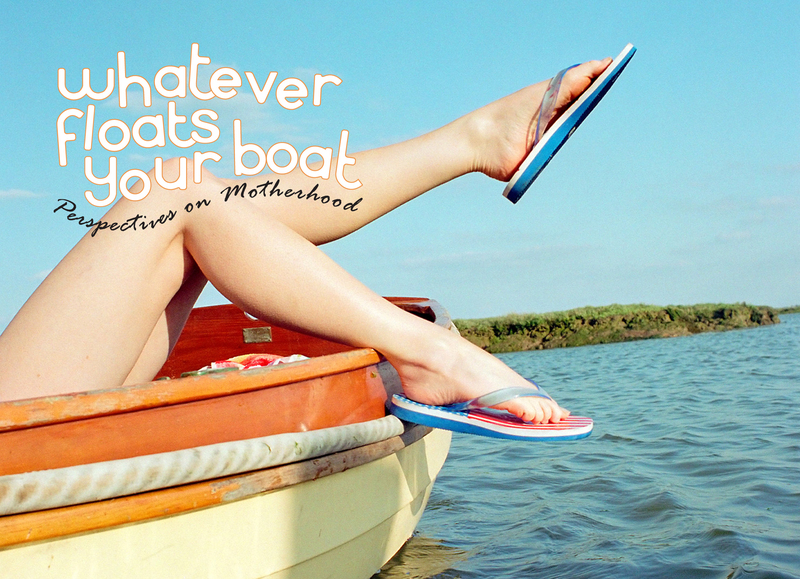 To view the documentary that explores Maryanne’s subsequent search to determine if motherhood was the road she wished to travel, here’s the link to view Whatever Floats Your Boat…Perspectives on Motherhood (53-min). Twelve women, one houseboat and the mother of all topics, the film is a candid look at the “to be or not to be…a mom?” decision. Maryanne Pope is the author of A Widow’s Awakening and the Board Chair of the John Petropoulos Memorial Fund. She is the Founder and CEO of Pink Gazelle Productions Inc and the executive producer of the documentary, Whatever Floats Your Boat…Perspectives on Motherhood. To subscribe to Maryanne’s weekly blog, here’s the link. Maryanne, what a raw and real story you have written. I am not a widow but a grief counsellor but it captures the pain of the realisations and how grief can be quiet one moment and you can eat eggs and then loud and you can do nothing but mourn. Thank you. Thank you so much for reading Squirrel at the Birdbell and taking the time to provide a comment. It is pretty wild how when you are grieving, things can be going reasonably okay one moment – and then in an instant, a memory or an image can send you in a completely different direction. Those early days of grief were SO difficult – and I am very thankful to be many years past that brutal time in my life. But I do think, as a writer, it is important to continue sharing what I experienced and learned, as I know so many others are just starting their journey through grief. Beautiful piece, and I love the story about the prize. A sweet surprise. Nature’s messengers with daily signs of life and continuity kept me going after my husband’s death. It began with a powerful dream that I would live in the House of the Green Man just 8 days after he died. I knew Nature would keep me grounded and comfort me. Not being touched with an Eros charge is still a hard one for me. Grateful for my dog. She has the affection part down. Hi Elaine! Yes…nature’s messengers are quite something, aren’t they? In fact, I was just thinking further about the significance of squirrels in my life – because they have appeared in my life at some very interesting times. So the timing of your feedback to this blog today was perfect! Take care and thanks so much for reading my blog! Thanks for sharing your poignant memories of losing Sam. Every persons journey through grief is unique, but it helps others to read your experience; lets them know they’re not crazy–or alone. Thank you for your comments, Gordon!